Dr. Jane Klug addresses the audience after several student testimonies from alumni Megan VonHaden, Lorrin Naasz and student Jessie Gramm about Jane’s impact in students’ lives. 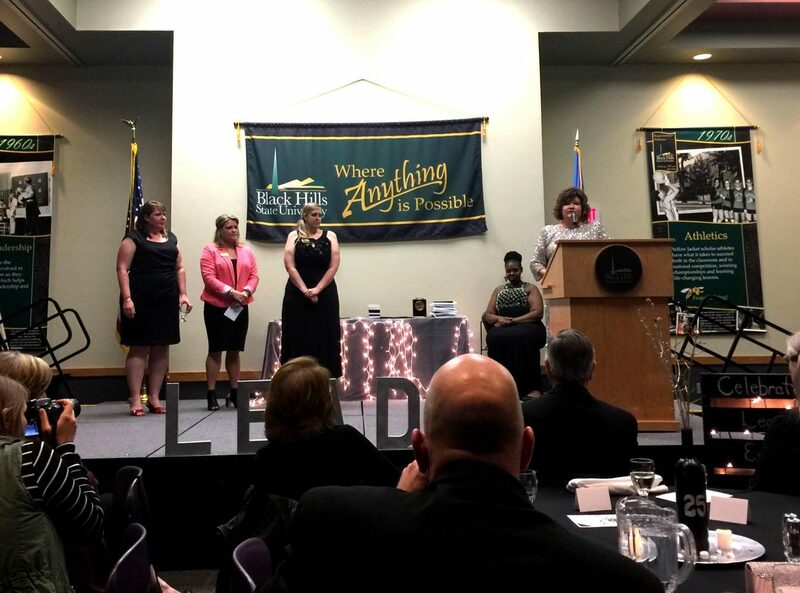 Black Hills State University hosted the 25th annual Student Volunteer Awards Ceremony in the Jacket Legacy Room on April 17 at 5:30 p.m. The event recognized the student leaders and organization volunteers for their commitment, dedication and hard work. Around 253 students, staff and faculty attended. The awards included individual leadership, organization and program, and Board of Regent awards. The Student Engagement and Leadership Center also honored the Leading-Edge Leadership Series class, Student Leadership Scholarship, and Outstanding Student Organization Member Award. The individual winners included Outstanding Residence Life Involvement: Kyle Schluttner, Outstanding Leadership in Residence Life: Bradley Branson, Outstanding Student Organization Advisor Dr.: Pam Carriveau, Outstanding Freshman: Grace Jensen, Vice President of Student Life Rising Star: Daxton Keegan, Outstanding Volunteer Nichole Valenzuela Walters, Outstanding Leader Justin Logue, and Excellence in Leadership: Shandell Clutter, Elizabeth Williams, Bailey Sadowsky, Shenae LaCroix, and Karley LaFountain. Elizabeth Williams also won the Spirit of BHSU award, which is chosen by the Alumni Association. Organization and program awards recipients included the Outstanding New Student Organization Thompson Diversion Program, Outstanding Student Organization Jacket Pack, and Most Improved Student Organization Human Services Sociology Association. Outstanding Program/Activity went to the Psychology Club’s ‘Take Back the Night’, HSSA’s ‘Mental Health Awareness’, and Outstanding Community Service Project Alternative Spring Break’s Service Week, Jacket Pack’s ‘The Nice List’, and YJ Friends Book Houses. Over 60 clubs chose and awarded their Outstanding Student Organization Member Award. 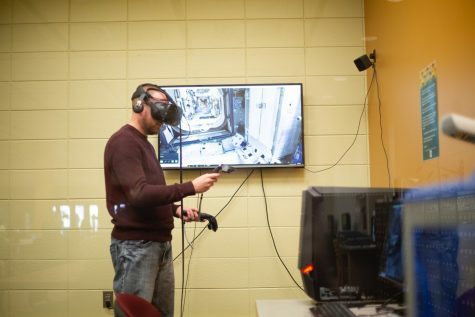 The Board of Regents awarded the South Dakota Education Association with Academic Excellence, the Campus Activities Board’s Activity Grants Committee with Organizational Leadership and the Thompson Diversion Program for Community Service. Megan Gayer was voted by student attendees of the event for the Student Leadership Scholarship. Peers nominated students and faculty members at the event. Nominees then completed applications and a committee comprised of seven BHSU faculty and staff members reviewed the applications and named the award recipients. Just less than 160 students and faculty applied for awards. The night started off honoring Dr. Jane Klug, Dean of Students, who started this event 25 years ago. Past and present student leaders expressed the impact Klug has made on them in their tenure at BHSU through videos or in-person. The Student Engagement and Leadership Center hosts and organizes this event annually. Dean of Student Dr. Jane Klug established this event in 1992.